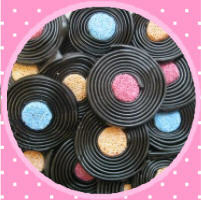 Classic wheels of liquorice wound tightly around a jelly button. Bet I can unwind mine faster than you can! CATHERINE WHEELS ingredients: Treacle, Wheat Flour, Glucose Syrup, Sugar, Water, Cornflour, Beef Gelatine, Natural Colours (Plain Caramel, Mixed Carotenes, Anthocyanins), Liquorice Powder, Aniseed Oil, Fruit & Vegetable Concentrates (Blackcurrant, Carrot, Radish), Spirulina, Citric Acid. Contains gluten, wheat and sulphites. May contain traces of milk.